Coriander likes a sunny spot and mulch to prevent it drying out. It needs to be kept well watered. If the plant dries out it will bolt to seed. Coriander planted in summer will quickly bolt to seed in high temperatures. Coriander is the actual name of the plant and seeds. If you are using just the leaves of the plant, it is referred to as Cilantro. So they are two different herbs from the one plant. You can begin harvesting the Cilantro leaves as soon as the plant is over 10cm tall. For the Coriander seeds, harvest once they start to turn brown. Coriander flowers are attractive to honey bees and butterflies so are good for companion planting. Coriander seeds are used in breads, Indian and Middle Eastern foods, Latin and Asian cuisine and is also a component of pickling spices. 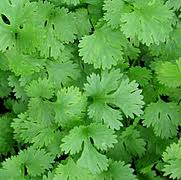 Cilantro leaves are very good in salads and vegetable dishes.